There has been no let-up for five years in the steady drumbeat of unrest among Tibetans in China, and the tempo now seems to be building to a crescendo. Chinese authorities have failed to produce any policy that addresses Tibetan claims about religious, ethnic, political, cultural and economic oppression in any meaningful way. And as the Tibetans' religious leader, the Dalai Lama, who is now 77, approaches the end of this incarnation, there are increasingly sharp divisions among leading political and religious figures, especially in the exile capital in Dharamsala in northern India where he lives. It has been evident for some years that the discovery of the new incarnation of the Dalai Lama is going to be a contentious and politically charged business. Nothing that has happened recently has given reason to change that judgment. More than 100 Tibetans in the Beijing-administered Tibet Autonomous Region, and predominantly Tibetan regions of neighbouring Sichuan and Qinghai provinces, have set themselves on fire - self-immolated - since this wave of protest against Chinese rule began in the run-up to the Beijing Olympics in 2008. Most of these people have died. The Chinese authorities have responded as they usually do in these situations. Security forces have encircled the most activist monasteries, turning them into little more than prisons, and have detained large numbers of monks, nuns and other Tibetans accused of instigating the self-immolations and street protests. Beijing has also attempted to mount a propaganda campaign against the Dalai Lama, accusing him of encouraging the self-immolations. 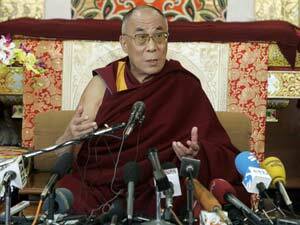 However, the Dalai Lama himself has given Beijing room to play with his words. In an interview last year with India's The Hindu newspaper, the Dalai Lama responded to questions about his lack of a clear denunciation of self-immolation as a protest tactic by saying it is a "very, very delicate political issue." "Now, the reality is that if I say something positive, then the Chinese immediately blame me. If I say something negative, then the family members of those people feel very sad. They sacrificed their own life. It is not easy. So I do not want to create some kind of impression that this is wrong." In theory, the Dalai Lama freed himself from such conundrums in 2011 when he relinquished the political leadership of Tibetans and the Tibetan movement for autonomy within China in order to live as a "simple monk." Following that retirement there was an election in which 50,000 among the 85,000 Tibetans in exile voted for a government with Harvard academic Lobsang Sangay as its prime minister. While many hoped this division of labour between the religious and political branches of Tibetan life would clarify the situation and perhaps lead to a resumption of talks with Beijing, stalled since January 2010, on Tibetan autonomy, this has not happened. Meanwhile, the political aspects of the religious future of Tibetan Buddhism is becoming more complex and immediate. There is no doubt that when the Dalai Lama dies, China will make every effort to take control of the process of discovering his reincarnation, and making sure the new religious leader follows Beijing's instructions. And the process of divining the identity of the new Dalai Lama is unclear enough for Beijing to be able to pick its own rival successor, and thus cause confusion in the Tibetan Buddhist community. Beijing's bid to take control of the process began 20 years ago with the death of the 10th Panchen Lama. He is second in the hierarchy of Tibetan Buddhism, and his political significance is that he traditionally leads the hunt for the new incarnation of the Dalai Lama. The Dalai Lama in 1995 identified a small boy in Tibet, Gedhun Choekyi Nyima, as the 11th Panchen Lama. But the Beijing authorities spirited Nyima away - he has not been seen since - and used another available method of discovering reincarnations - picking names from a golden urn - to identify another small boy, Gyain-cain Norbu, as the 11th Panchen Lama. Norbu has, of course, been raised by Chinese authorities to present Beijing's views on religion and its role in society. In January 2000, however, a young monk escaped from Tibet to Dharam-sala who adds another unknown factor to the equation of the succession. He is 28-year-old Ogyen Trinley Dorje, the 17th Karmapa, who is head of the Karma Kagyu school, one of the four main schools of Tibetan Buddhism. Dorje has emerged as a charismatic religious teacher among followers of Tibetan Buddhism worldwide. He also works with the World Wildlife Fund and writes on environmental issues. There is, unsurprisingly, a movement to have the Dalai Lama name Dorje as his successor. Whatever happens, a shattering of the Tibetan religious and political leadership appears inevitable, with little likelihood that a clear voice championing the aspirations of the Tibetan people will emerge.